This time we are reviewing our ‘hidden gem’ along Old Klang Road. We used to refer to the place as ‘Nameless restaurant’ until owner Mr. Lee told us that the name of the place is actually Restoran Puyuan. Puyuan is not just a Chinese Hokkien restaurant along Old Klang Road; it might just be the best Chinese Hokkien restaurant in the whole region. When we brought along one of our local buddies he was so amazed by the style, the dishes and the quality that he actually said the following: “I have to bring my mother here, she will love the food over here”. How big a compliment can a restaurant get :). Our local friends introduced us to this place. At first we were a bit cautious as the place looks a bit worn and people clearly weren’t that used of having foreigners over for dinner. After a few visits they started to recognize us and now they always seem happy when we bring new people over (as every time we have guests over we take them to Puyuan for the really local dinner experience). Apparently a relative of Mr. Lee also owns a Hokkien restaurant nearby. It is of similar style and also highly recommended by many. 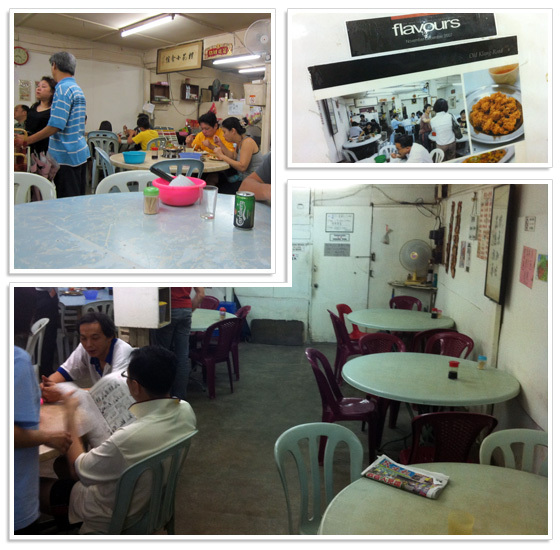 This restaurant can be found along Jalan Kuchai Lama and is called Restoran Lim Kee. Common, when you’re experiencing local Chinese cuisine at this place you cannot seriously expect us to write down negative aspects :). I mean, it is local, very very local. And it is basic, very very basic. You are seated at big round tables, and you are sitting on basic plastic chairs. There is nothing cozy about the place, except for the fact that it is also used as an extension of the owners’ living room. It is white, bright and when entering there is nothing that gives away a clue on how good your dinner over here will probably be! A possible negative for some is the price. If you want to share dishes with others, you better ask for small portions. Bigger portions are all above RM10 per dish. When we are eating there with 4 people for example, the final bill easily ends up above RM80. Fantastic atmosphere, although a bit cold, bright and white. The place scores big points with its amazing food. 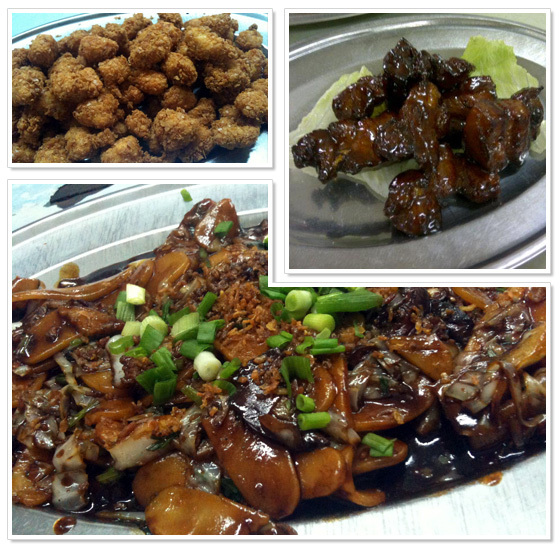 Dishes like ‘Marmite Pork’, ‘Honey Pork’, Popcorn Chicken, Signature Tou Fu, Chao Shue Fen and Chao Bat Ko are amazing. Prices are very decent. Local people we brought here have now added this place to their list of favorite local restaurants. Foreign visitors have experienced real local Chinese food, and they all loved it. Some years back Puyuan was mentioned a few times in local culinary magazines. This brought them their fame. Since then they have been able to keep their dishes of great taste and quality. Some may find the prices a bit too steep, but this probably is not a big deal for tourists. When you are visiting the place with local people that know the place and are familiar with the typical and traditional dishes; you might have a better time. If you are visiting Puyuan alone, just make sure you write down a few of the dishes we mentioned and you’ll be sure to have a great dinner. We love the place and always try to visit it at least once a month. We rate it a good 8/10, a perfect place for a real local experience. Opening hours: Daily from 11.30am to 3pm and from 6pm to 10pm. Mentioning their contact details might not be enough to actually find the place, as it lies quite hidden from the view from the main road of Old Klang Road. Puyuan is located along Batu 4 1/2 Jalan Klang Lama (Old Klang Road). When you are coming from the city center (Mid Valley) the restaurant will eventually be on your left hand side. At some point you will pass the crossing with the road that leads to Taman Desa. After a few hundred meters you will pass the new Tesco Supermarket on your right hand side. Keep to the left and slow down. You will pass a viaduct and then you take the first small road to the left. If you are already at the next big crossing into Kuchai Lama you missed the exit and then you have to make a U-turn and try again :). When you enter the small alley you will see a few small restaurants on your left hand side. Between those restaurants there is an even smaller alley. Park your car somewhere (usually ample space available) and walk into that alley. The restaurant ‘door’ is immediately to the left (with no name at the entrance, unless you understand Chinese).